Picture taken in 1961 when Fachy Dunn made a visit to Kamloops, British Columbia, Canada. 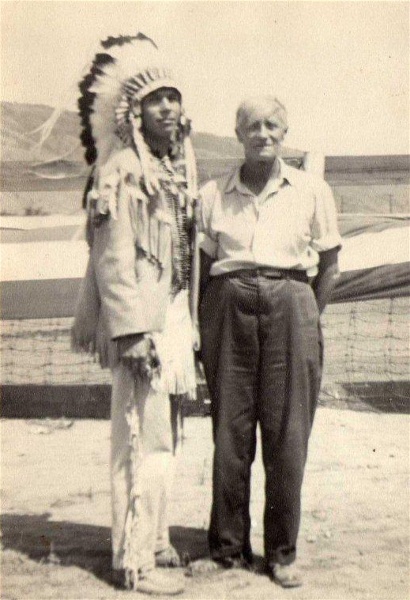 He was fortunate enough to have a picture taken with an Indian Chief. I remember him having it taken - the temperature was around 100 degrees F.
Harry. this is a very good photo of your grandfather. Harry, What a good photo this. Your Grandfather looks great. Thanks Catherine and Rosalie, one of the few pictures of him without his bonnet due to the heat. So at least two folks from Inverg have been to Kamloops! My wife and I stayed in Joyce's B&B there in 2003 as we drove around BC dodging forest fires. I guess the chief is getting on a bit now (aren't we all?) Out of the place is Kamloops. What I really meant was "...out of the way place"
Hi Harry I have this photo I was given it when my Grandad (Harry Dunn) passed away. My dad told me that this is my Great-Grandad Fachy Dunn oh my god my Grandad was his double. Hi Angie, yes even myself starting to look like him. Your great great grandfather is also on this site and the resemblance there is incredible.